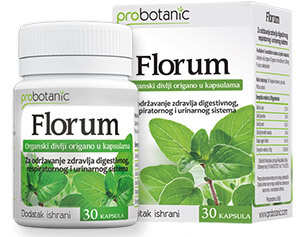 FLORUM is a dietary supplement, which contains 100% pure and natural wild oregano. As opposed to cultivated oregano, which we use as a seasoning, wild oregano cannot be cultivated, because it grows at high altitudes in the mountains in the vicinity of the Mediterranean Sea, within a specific climate. FLORUM is produced from the most powerful and the strongest of all the varieties of wild oregano – Origanum minutiflorum. This variety of wild oregano is an endemic species and it thrives only in the southern Turkey. What is FLORUM and the method of its administration? FLORUM is used for prevention and as a support in overcoming difficulties in occurrence of harmful microorganisms in the body. FLORUM maintains health of the organs of the urinary, digestive, and respiratory systems. Its administration is recommended until the complete elimination of harmful microorganisms from the body. Recommended dosage is 3×1 capsule per day, before meals. To be taken with water. FLORUM is to be kept at room temperature, in a dry place, out of reach of children. The product should not be used upon the expiry of the date indicated on the packaging. The persons who are allergic to any component of the product, pregnant women, nursing mothers, and children may not use this preparation. Carvacrol is a substance that belongs to the class of phenols and is contained in oregano. According to numerous studies, the main antibacterial and active ingredient of oregano is carvacrol. Carvacrol has the greatest impact on antivirus, antibacterial, antifungal, anti-parasitic, antiseptic, and antioxidant properties of wild oregano. The higher the percentage of carvacrol, the more valued and efficient oregano is. In 1994, the Royal Botanic Garden established that Origanum minutiflorum contains the highest percentage of carvacrol. Way back in 1910, it was scientifically confirmed that wild oregano is the strongest herbal antiseptic in the world. Dr. Cass Ingram, who is engaged in the research in wild oregano, claims that „Wild oregano is the Rolls Royce among natural antiseptics“. The USDA has established that wild oregano is 40 times stronger antioxidant than apples, 12 times more than oranges, 5 times stronger than blueberries. The U.S. Department of Agriculture has demonstrated that wild oregano is a 3-20 times stronger antioxidant than all the plants they have studied. Oregano oil is produced from wild oregano, which is included in our offer. Oregano Oil is 26 times stronger than phenol, a powerful compound used for sterilization of surgical equipment. One liter of Oregano Oil sterilizes 4000 liters of septic water eliminating all the microorganisms.